Water on campus is delivered from the Washington Suburban Sanitary Commission (WSSC). Ultimately, the quality of water on campus is the responsibility of WSSC, as our water supplier and as the entity which is compelled to comply with applicable federal and state water quality regulations. Local water treatment is neither required nor provided by the campus. When underground water lines break on or off campus, the resulting repairs may cause dirt to be introduced into the lines. 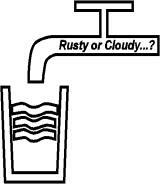 Water may appear discolored, cloudy or rusty once water service is restored. Also, when the fire department or campus life safety staff open fire hydrants as part of their annual checks, sediment can be brought along in water lines. This, too, may cause water to appear cloudy or rusty. Milky-looking water is often caused by introducing air into water lines, often in conjunction with a pipe repair. Minute air bubbles change clear water to slightly opaque or white. Running water in sinks or showers will help draw the discolored water through the lines. Avoid flushing toilets until lines are cleared to avoid trapping dirt in the flush valves which could affect their operation. Avoid doing laundry. If a load of wash was started, water company officials suggest redoing the wash cycle once the water lines have been cleared. When most problems like these occur, water companies usually state the water is safe to drink. You may prefer to wait until the water is clear again before drinking or cooking. Although these are almost always the reasons water may not look perfectly clear, feel free to report suspect water to x4-WORK so someone can look into each problem. Since most causes of discolored water are temporary in nature and result from repairs outside of the building or even off campus, often little more will be done other than to let the building residents run water to clear the lines.